MOSCOW, Russia (CNN) -- The first day of meetings on the future of Iran's nuclear program ended Monday on a note of optimism from the director-general of the U.N.'s nuclear watchdog agency. 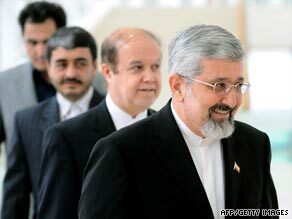 Iranian Ambassador to the (IAEA) Ali Asghar Soltanieh arrives for Monday's talks in Vienna. "We have had quite a constructive meeting," said Mohamed ElBaradei of the International Atomic Energy Agency. "We are off to a good start. Most of the technical issues have been discussed and we will continue tomorrow." His comments came after officials from Tehran had huddled with representatives of the United States, Russia and France at the IAEA headquarters in Vienna. Monday's meetings ended before 6 p.m. (noon ET) and were slated to reconvene Tuesday at 10 a.m. (4 a.m. ET). Participants included Iran's envoy to the IAEA, Ali-Asghar Soltaniyeh; Nikolay Spassky, deputy head of the Russian Federal Atomic Energy Agency; Frederic Mondoloni, French representative to the IAEA; and U.S. Department of Energy Deputy Secretary Daniel Poneman. The world powers and Iran agreed in principle at the beginning of October that low-enriched uranium produced in Iran -- not weapons-grade material -- would be sent abroad for further enrichment, then returned for use in medical research and treatment. Details of the tentative deal are expected to be worked out at the Vienna meetings, which could stretch into Tuesday, according to Javier Solana, the European Union foreign policy chief. A senior U.S. official has said that the enrichment would take place in Russia. "The potential advantage of this, if it's implemented, is that it would significantly reduce Iran's [low-enriched] stockpile, which itself is a source of anxiety in the Middle East and elsewhere," the official told reporters on October 1. It's a source of anxiety because low-enriched fuel has the potential of being further enriched into weapons-grade uranium. The uranium enriched in Russia would then be processed into fuel cells by France and returned to Iran for use in its medical reactor, which is projected to run out of nuclear fuel in 12 to 18 months. Ali Shirzadian, spokesman for the Atomic Energy Organization of Iran, said Tehran is capable of doing the job itself. "This will be a test to see how sincere the West is," he told the state-run Islamic Republic News Agency, referring to the plans to provide Iran with enriched uranium. "Iran is capable of uranium enrichment ... and will produce it to feed the Tehran research reactor, if needed." Iran says its nuclear program is intended solely for peaceful purposes, but many in the international community have accused the country of trying to develop nuclear weapons capability. Tehran sent shock waves through the international community recently by revealing the existence of the nuclear enrichment facility in a letter to the International Atomic Energy Agency. On October 25, U.N. nuclear inspectors are to visit the facility, which is located near the city of Qom. "It is important for us to send out inspectors to do comprehensive verification ... to assure ourselves that it is ... fit for peaceful purposes," ElBaradei said this month. During a news conference Sunday in London, U.S. Secretary of State Hillary Clinton reaffirmed the Obama administration's stance on Iran. "It has a long way to go before any of us are convinced that Iran is willing to abide by its international obligations and to cease and desist any efforts toward its nuclear programs," she said. It is important for Iran to know that the world is watching, added Clinton, who was completing a diplomatic trip in Europe. "The international community will not wait indefinitely for evidence that Iran is prepared to live up to its international obligations." CNN's Matthew Chance and Michael Sefanov contributed to this report from Vienna.